Like, I just don't know. I was at a soccer game and that for one, is like, why. And then I was sitting inside because why would I actually sit outside in the Texas heat and watch a soccer game. Now, I don't know if anyone is impressed by this, but my parents are always v v impressed with my ability to recognize people who I have never met or are disguised or are random (i.e. David Cook). I think it's just something I'm slightly good at, so they praise it because I have no other talents. But as I saw David Cook walk by, my brain told my mouth to shout, "DAVID COOK?" It was v v obvious by the look on his face that he has not been recognized since possibly the day he won American Idol. But he stops and at this point, I am so in shock that David Cook is in front of me and that I had the balls to call out his name. Then my brain tells my mouth to say, "Oh, hi. You don't know me. I'm just a fan." A fan. A FAN. a fan. afan. a f-a-n. I am a fan of David Cook's in that I did vote for him for American Idol and I did download his version of Eleanor Rigby on my iPod Nano. So, yeah, I'm a fan. 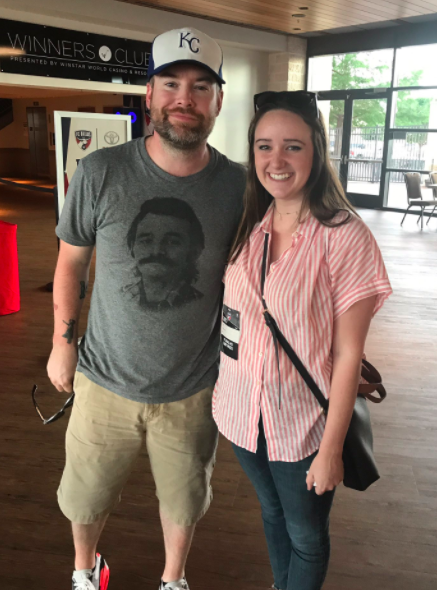 I shake his hand and then I meet his friend who he is with and then I ask him why he's in Frisco, Texas at a soccer game. He says it's for a friend's Bachelor party. And then that was it. I asked him for a picture and then said my goodbye. It all happened so fast, I didn't even have a chance to ask him anything slash like what the hell do you ask an American Idol winner from like 2007. That's all. That's my story. I will say I think about this moment when David Cook asked out Kim Caldwell on national TV at least once every three months.